What is NEW for Tax Season 2015? Home » Articles » Domestic Tax Law » What is NEW for Tax Season 2015? Publication 17 has been published annually by the IRS since the 1940s and has been available on the IRS web site since 1996. The 286-page guide also provides links to help taxpayers quickly get answers to their questions. This free comprehensive tax guide is available on IRS.gov. Information reporting about health coverage. If you or someone in your family had health coverage in 2015, the provider of that coverage is required to send a Form 1095-A, 1095-B, or 1095-C (with Part III completed) by January 31, 2016, that lists individuals in your family who were enrolled in the coverage and shows their months of coverage. Note: Publication 17 states that: Forms 1095-B and 1095-C due dates extended. The due date for furnishing 2015 Form 1095-B, Health Coverage, and the 2015 Form 1095-C, Employer-Provided Health Insurance Offer and Coverage, has been extended from January 31, 2016, to March 31, 2016. Information reporting about employer offer of coverage. If you or someone in your family was an employee in 2015, the employer may have sent you a Form 1095-C. Part II of Form 1095-C will show whether your employer offered you health insurance coverage and in-formation about the offer. A. Indicate on your tax return that you, your spouse (if filing jointly), and anyone you can or do claim as a dependent had qualifying health care coverage throughout 2015. B. Claim an exemption from the health care coverage requirement for some or all of 2015 and attach Form 8965 to your return. C. Make a shared responsibility payment if, for any month in 2015, you, your spouse (if filing jointly), or anyone you can or do claim as a dependent didn’t have coverage and does not qualify for a cover-age exemption. Requirement to reconcile advance payments of the premium tax credit. If you or a family member enrolled in health insurance through the Marketplace and advance payments of the premium tax credit were made to your insurance company to reduce your monthly premium payment, attach Form 8962 to your return to reconcile (compare) the advance payments with your premium tax credit for the year, which you figure on Form 8962. The Marketplace is required to send Form 1095-A by January 31, 2016, listing the advance payments and other information you need to figure your premium tax credit. Achieving a Better Life Experience (ABLE) account. This is a new type of savings account for individuals with disabilities and their families. For 2015, you can contribute up to $14,000. Distributions are tax‐free if used to pay the beneficiary’s qualified disability expenses. Due date of return. 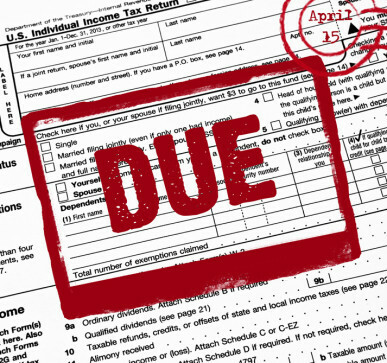 File your tax return by April 18, 2016. The due date is April 18, instead of April 15, because of the Emancipation Day holiday in the District of Columbia—even if you do not live in the District of Columbia. If you live in Maine or Massachusetts, you have until April 19, 2016. That is be-cause of the Patriots’ Day holiday in those states. Public safety officers. Certain amounts received because of the death of a public safety officer are nontaxable. Direct deposits of refund to a myRA® account. You now can have your refund directly deposited to a new retirement savings pro-gram called a myRA®. This is a starter retirement account offered by the Department of the Treasury. Health coverage tax credit. The health coverage tax credit, which expired at the end of 2013, has been reinstated retroactive to January 1, 2014. Additional child tax credit. You can’t claim the additional child tax credit if you file Form 2555, Foreign Earned Income, or Form 2555-EZ, Foreign Earned Income Exclusion. My Social Security Account. Social security beneficiaries can now get a variety of information from the SSA website with a my Social Security Account. Application of one‐rollover‐per‐ year limit for IRAs. Starting in 2015, you can make only one roll-over from one IRA to another (or the same) IRA in any 1‐year period regardless of the number of IRAs you own. However, you can continue to make unlimited trustee‐to‐ trustee transfers between IRAs be-cause this type of transfer is not considered a rollover. Also, there is no limit to the number of rollovers from a traditional IRA to a Roth IRA (also known as conversions). Don’t be a victim of your own making. If you need assistance in understanding all of I.R.S.’s updates, consult your tax specialist immediately.